In this week’s parsha, Chukat, Moses is once again feeling the stress of leadership. Tired and quickly losing hope following the death of his sister Miriam, the Israelites complain to Moses that they would have rather died in Egypt. They go so far as to wish they had died a horrible death along with those punished for joining Korach’s rebellion. They grumble that they were happier during their slave years in Egypt, where at least they had certain assurances compared to their current nomadic experience. They protest that they have been brought to a wretched place with no good food to eat or water to drink. 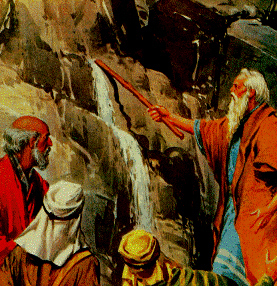 Several excuses can be made in defense of Moses’ action. Clearly the leadership of such a complaining nation in the hot desert grew taxing on Moses, raising his stress level and making it more difficult to reason with the Israelites. Further, he did have the best interest of the people in mind when answering their call for more drinking water. However, he allowed his emotions to get the better of him and resorted to hitting rather than speaking. While Moses hit an inanimate object rather than speaking to it, his action should alert us to a serious problem today. Domestic violence occurs in Jewish families at about the same rate of 15% as in the general community. However, studies demonstrate that Jewish women tend to stay in abusive relationships two or three times longer than those in the general population. The misnomer that domestic abuse is not a Jewish concern further exacerbates the problem by discouraging abused women from reporting the abuse to others. Rather than speaking to each other about difficult issues within the relationship, many partners (mostly men according to statistics) resort to violence. Oftentimes, men blame their abusive actions on stress from work and they allow their emotions to impair their better judgment. Regardless of how demanding one’s life may seem with weighty responsibilities at home and at work, resorting to abuse is never acceptable. The lesson of Moses aptly demonstrates this for us. His punishment was indeed severe, but so is the message it sends to our community. It is always better to use words than to hit. For more information on domestic abuse in the Jewish community, visit www.jcada.org.